Having an attractive and functional Edgecott log basket in your home is the perfect choice for holding extra wood for your fireplace. The traditional design of the basket will fit well into any home's decor, and the sturdy construction will allow for easy and mess-free transport of logs from any location to your fireside. The deep stain used on the durable wicker weave highlights the elegant pewter tone handles. This basket holds its own in the style department and can sit proudly in view near your fireplace. Measuring 460mm high, 560 mm wide and 450 mm in depth, it can hold enough logs to get your fire crackling. The handy basket keeps extra logs off the floor, yet close at hand, so your room always looks orderly. The dark colour hides dirt and the superior quality of the materials used in the Edgecott log basket ensure long-lasting appeal. 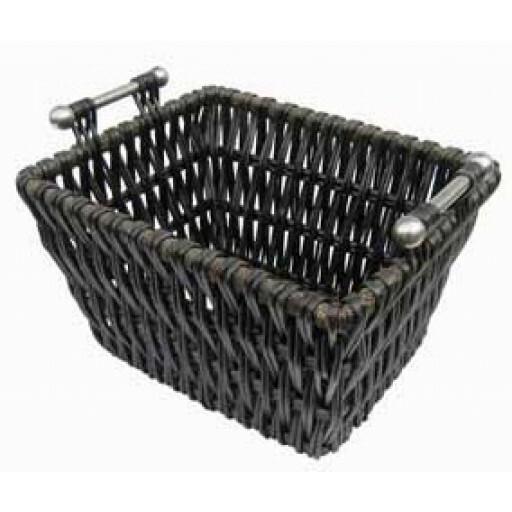 For a practical way to contain your logs that still looks terrific year in and year out, the beautiful design of this woven wicker basket will not disappoint. The fine craftsmanship of this log holder is apparent, and with normal use, there is a two-year manufacturer guarantee against faulty materials or workmanship. The Edgecott log basket is a pleasing addition to any home and would make a thoughtful gift for those who enjoy relaxing before a fire. Just the job as a last minute birthday pressie - looks better in real life than the pic!